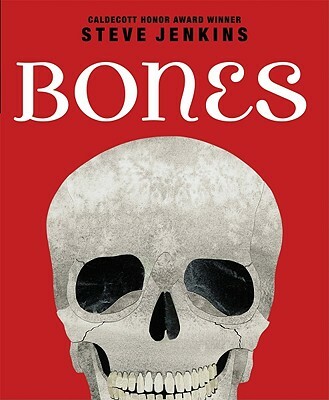 Bones by Steve Jenkins. (Grades K-5.) Scholastic, 2010. Unpaged. Review copy provided by my local library. This book has been nominated for a Cybils Award and this review reflects on my own opinion. "The femur, or thigh bone, helps an animal stand and walk. In animals that live on land, this bone is often the longest in the body." And, of course, he includes his signature cut-paper illustrations. Now, normally Steve Jenkins's illustrations are impressive. In Bones, his illustrations are actually kind of mind-blowing. "The forelimbs, or arms, of most bony animals and build from the same pieces: one large upper arm bone, two smaller forearm bones, a bunch of little wrist bones, and a set of finger bones. Animals may vary greatly in size, and they may use their arms to do very different things, but their forelimbs all share the same basic set of bones." After reading that, I went back to the illustrations and, sure enough, I could pick out the structures that they had in common. Some skeletons are represented in their entirety - a human skeleton, a two-toed sloth, even a python with nearly 200 pairs of ribs. And this is where I get really impressed. The amount of painstaking work that went into creating these illustrations just blows my mind! Some of the bones are shown actual size (which is really cool) and for the ones that are not, Mr. Jenkins includes a note about the scale. In the back of the book are two spreads with additional information and fun facts about bones. The only thing missing is a source note, though Mr. Jenkins does thank Darrin Lunde of the American Museum of Natural History for consulting. And I'm not sure what my real feelings are about source notes in nonfiction picture books. The librarian in me loves to have a source note, but probably kids don't look at them unless they're particularly curious, especially in titles geared towards younger readers. So maybe I should get over it? This is a particularly impressive offering by one of the central authors of children's nonfiction. Bones is on shelves now! Happy Nonfiction Monday! Head on over to books together for this week's roundup!